Posted June 14, 2017 by Dr. Kezirian & filed under Palate Surgery, Sleep Apnea, Surgery. May and June are busy months for major medical conferences. May had the 8th meeting of the International Surgical Sleep Society that we hosted at the University of Southern California, and I recently returned from giving lectures at the Sleep 2017 meeting in Boston. Later in June, I will be speaking at the International Federation of Oto-Rhino-Laryngological Societies conference in Paris later this month. I always speak on a range of topics; at these conferences one new themes that I am incorporating into my talks are the recent studies suggesting that it might be time to consider closer evaluation of tonsillectomy alone as a first-line treatment for adults with markedly enlarged tonsils and obstructive sleep apnea. In this blog post, I wanted to share some interesting topics and studies presented at the Sleep 2017 meeting. First, in my presentation on recent surgical studies during the Year in Review session, I challenged the audience of about 400 sleep phsyicians (mostly non-surgeons) with the discussion of tonsillectomy and other surgical topics, and I did not see much argument on the question of whether it should be studied more systematically. As a surgeon, my experience agrees with these studies showing that tonsillectomy alone provides dramatic improvement in sleep apnea, and the sleep medicine colleagues with whom I work have certainly seen this. 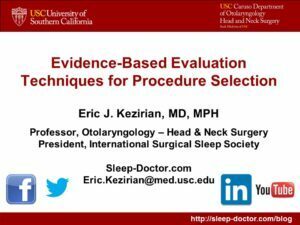 For anyone interested in my discussion of the tonsillectomy studies and other evidence related to how we select procedures, here is a link to a video of the presentation at the International Surgical Sleep Society meeting. In addition to my own talks, a key reason for attending these meetings is to learn from other speakers. Inspire Medical’s Upper Airway Stimulation technology was discussed in multiple sessions, including some research presentations. The most important presentation was from Dr. Patrick Strollo of the University of Pittsburgh, who presented Upper Airway Stimulation outcomes at 5 years following surgical implantation. The findings showed that the results at 5 years were stable and equal to those at 2, 3, and 4 years, whether for sleep study results or symptoms like sleepiness and quality of life. This is not surprising, as the results at 3 years following implantation already demonstrated this pattern of consistent results, but it is very reassuring for me as a surgeon and for patients. As has been the case from the beginning, 80% of patients reported use every night, which is completely different than their intolerance of positive airway pressure therapy. There was substantial discussion during the conference about the growing number of randomized trials showing that CPAP improves symptoms but has not shown the ability to prevent cardiovascular events like heart attacks and strokes or, even, death. The most recent study was the Sleep Apnea Cardiovascular Endpoints (SAVE) Trial. In this randomized trial comparing CPAP plus usual care to usual care alone for patients with obstructive sleep apnea and coronary or cerebrovascular disease, there was no difference in cardiovascular endopoints. One criticism of the trial was that overall adherence to CPAP was poor, but even those patients who did use CPAP regularly did not experience a reduction in cardiovascular events. Studies like this are really putting the field of sleep medicine in a crisis. It is pretty clear that severe obstructive sleep apnea increases the risk of cardiovascular events and mortality, but the question is whether treatment can do anything about it. CPAP is the treatment that has been studied most closely, and so far the results for treatment do not suggest major health benefits, aside from a decrease in recurrence of atrial fibrillation after cardioversion. When it comes to surgery, I have performed a published study showing that individuals who experience major improvements in their sleep apnea after surgery also may improve their risks of cardiovascular disease, based on a blood test called C-reactive protein. But this is not the same as lowering actual cardiovascular events like heart attack and stroke, although such a study would need to be much larger than I can do and would require substantial funding. I look forward to the upcoming Paris meeting and the chance to see long-time colleagues. Given that our recent ISSS meeting already included most of the sleep surgery speakers, I will be attending some of the talks in fields other than sleep surgery.